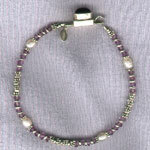 Sterling and amethyst bracelet with freshwater pearls and an amethyst box clasp. 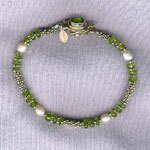 Sterling and peridot bracelet with freshwater pearls and a faceted peridot box clasp with safety. 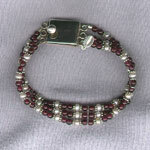 Triple-strand garnet and freshwater pearl bracelet with sterling accents and clasp. 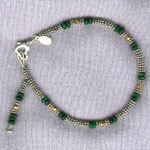 Sterling and malachite bracelet with brass accents, heart-shaped lobster clasp and dangle.